Off On A Tangent: Save Ring Dings! Hostess Brands -- the maker of such iconic baked goods as Twinkies, Devil Dogs and Wonder Bread -- announced Friday that it is asking a federal bankruptcy court for permission to close its operations, blaming a strike by bakers protesting a new contract imposed on them. 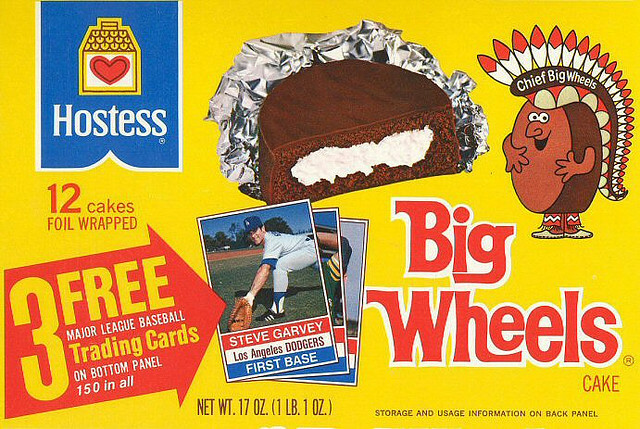 I know the ingredients are not the best, including high fructose corn syrup, but I grew up eating Big Wheels, and loved them. Bad day for High Fructose Corn Syrup. Hostess is officially going out of business. It turns out that Ring Dings are Big Wheels. In a new biography titled Bruce, by Peter Ames Carlin, we're told that as a young man, Springsteen "had the gastronomic sophistication of a feral dog, feasting on Velveeta-and-mayonnaise sandwiches, or the glistening fried chicken at the Tasty Dee-lite drive-through. Vegetables rarely made an appearance ..."
Carlin had the cooperation of Springsteen in this biography, according to The New York Times. The book opens in 1971 with a description of highly creative weekly monopoly games, in which Springsteen excelled, "due both to his shifty powers of persuasion and the leverage provided by the sacks of candy bars, Ring Dings, and Pepsis he brought with him." He won so many games that the other players nicknamed him the Gut Bomb King, but Carlin reports that this "lasted only until Bruce, who also had a talent for inventing nicknames, came up with a new one for himself: the Boss." The company marketed the snacks on the East Coast as Big Wheels, to avoid confusion with the Ring Ding, a similar (and pre-existing) treat by Drake's Cakes. 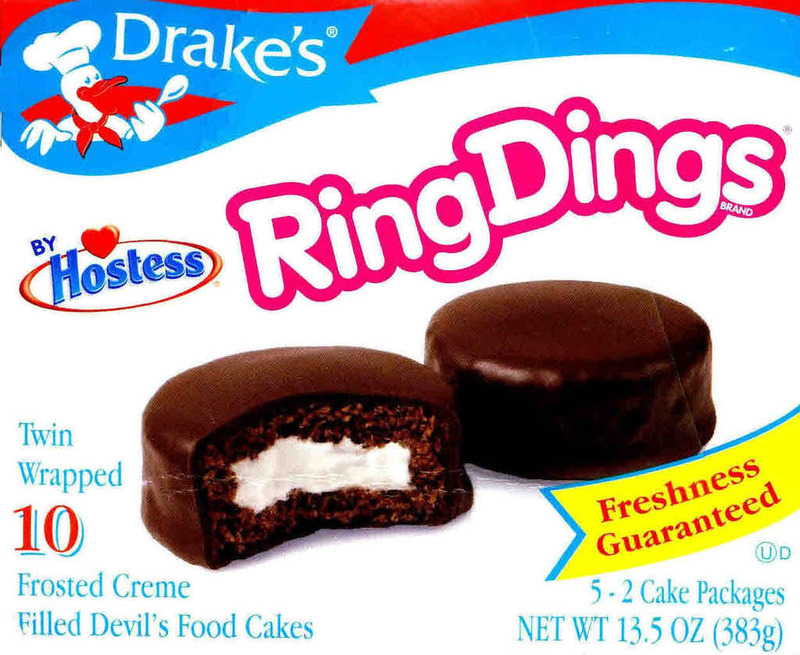 The names were consolidated in 1987, when a short-lived merger of Drake's with Hostess' parent company (then Continental Baking Company) briefly resolved the Ring Ding/Ding Dong conflict. 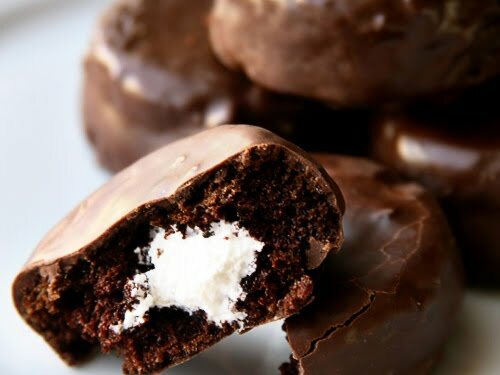 When the merged company broke up, however, Hostess was forced to cease, once again, using the Ding Dongs name in areas where Ring Dings were available. 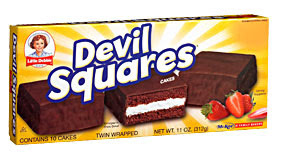 The compromise sound-alike name King Dons lasted until Interstate Bakeries Corporation, which had recently merged with Hostess' parent company, bought Drake's in 1998. 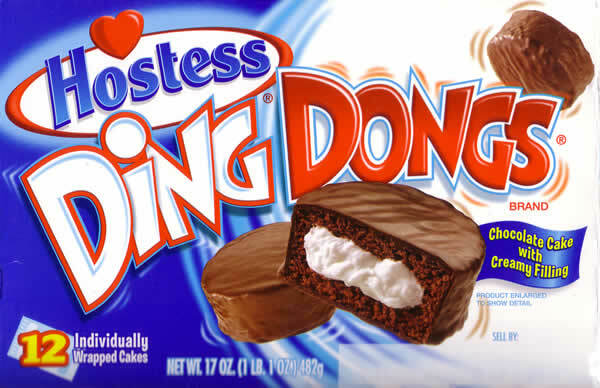 The Hostess product is now sold under the name Ding Dongs throughout the United States. However, the snack is still sold as the King Don in Canada. They're still sold as Ring Dings in Boston. Chocolate frosted hockey puck shaped chocolate cakes with vanilla creme filling. Another version is filled with custard and labeled Boston Creme Pies. Originally sold one per package (4" Diameter, .5" high) and also in a yellow cake / milk chocolate frosted variation. Outside of New England they're Ding Dongs. Ring Dings are going away if the Hostess bankruptcy goes through and no one buys up the assets. Hostess, the maker of Twinkies and Wonder Bread, is going out of business, closing plants, laying off its 18,500 workers and putting its brands up for sale. In addition to dozens of baking and distribution facilities around the country, Hostess Brands will sell its popular brands, including Hostess®, Drakes® and Dolly Madison®, which make iconic cake products such as Twinkies®, CupCakes, Ding Dongs®, Ho Ho’s®, Sno Balls® and Donettes®. Bread brands to be sold include Wonder®, Nature’s Pride ®, Merita®, Home Pride®, Butternut®, and Beefsteak®, among others. Sugar, Corn Syrup, Water, Enriched Bleached Flour (Wheat Flour, Niacin, Reduced Iron, Thiamin Mononitrate, [Vitamin B1], Riboflavin [Vitamin B2], Folic Acid), Palm and Palm Kernel Oil, Partially Hydrogenated Soybean and Cottonseed Oil with TBHQ To Preserve Flavor (Contributes a Trivial Amount of Trans Fat), Cocoa, Dextrose, Soybean Oil, Egg Whites, Invert Sugar, Emulsifiers (Mono- and Diglycerides, Soy Lecithin, Sorbitan Monostearate, Sodium Stearoyl Lactylate, Propylene Glycol Monostearate, Polysorbate 60, Polysorbate 80, Polyglycerol Esters of Fatty Acids), Colors (Caramel Color, Red 40), Leavening (Baking Soda, Sodium Aluminum Phosphate), Salt, Corn Starch, Eggs, Whey (Milk), Modified Corn Starch, Sorbic Acid (to Retain Freshness), Natural and Artificial Flavors, Citric Acid. There was a time; admit it. There was a time when, if given a choice between a warm pastry fresh from a baker’s oven and an ageless package of Ring Dings fresh from the 7-Eleven, you would have chosen those Ring Dings. Not even close. After opening the tinfoil or cellophane wrapping with curatorial care, so as not to disturb the faux-chocolate frosting, you would have gently removed the puck-shaped treat and taken a bite deep enough to reveal crème — not cream, but crème — so precious that a cow’s participation was incidental to its making. Now I want a Ring Ding. They have Drake. Ring Dings in New York City, also. I didn't know what a Hotess Ding Dong was until I read this (seriously, I didn't). Ironically I saw a store that sold both Ho Hos and Yodels they were identical, not almost Identical, but identical. The Hostess version was $1.59 while the Drake's was 99 cents. I was like what the heck? !